Seeing this reminded me of a pouch I had when I was little and how much I loved the satisfying ‘snap!’ when you let the flex frame go to close the pouch. Having nothing better to do at that moment, I sourced a pack of 3.5 inch flex frames on ebay and bought them. I didn’t think about this again until several weeks later when I was looking for a little sewing project to give my hands a break from the knitting needles. 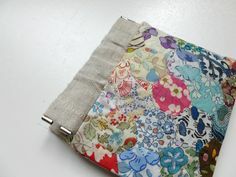 I planned to use this for the outer of the purse and my old favourite, Robert Kaufman Essex Linen, for the lining. I decided this would be a job for my trusty (cue maniacal laughter) £99 John Lewis sewing machine and set to work. Sadly, the sewing machine wasn’t over impressed with some of the thicknesses of fabric I asked it to sew together (what’s new? ), so the first attempt did get a teeny bit chewed up… I got to work on making a 2nd pouch with the same fabric plan, but I stupidly cut it out to the wrong measurements. I turned off the light in the studio and called it a day! I found the outline image for this little fox on a Google image search and embroidered it onto the felt with perle cotton thread. I’m really pleased with the embroidery and the making up, but I didn’t like the look of the inside of the pouch with the back of the embroidery showing, and didn’t feel that the channels at the top that the flex frame goes through, were exactly the right size. The felt feels gorgeously luscious too – I get packs of 1mm sheets from Cloud Craft on Etsy in lovely rich colours. oh how adorable! I love rabbits, and I love the Bluebird Park fabric so I’m head over heels for this!